Gaming-to-go - Part Two. Lots of power packed into an attractive case - that is one way to describe this Zenbook. An IPS panel and SSD complete the package. Even with its high-performance components, its battery life is good as well. Does the Zenbook have weaknesses too? Keep reading to find out. Just a few weeks ago, we reviewed the Zenbook UX32LN-R4053H. Now we have another model from the same series in our laboratory -- the UX32LN-R4029H. While the first model was outfitted with a Core i5 processor, the second has a Core i7 at its command. Does the stronger i7 processor provide enough extra performance to justify the increase in price? Our review reveals the answer. The Zenbook is currently available for about 1100 Euros (~$1500). The Acer Aspire S3-392G (Core i5-4200U, GeForce GT 735M) constitutes one of its competitors. The recently updated Apple MacBook Air 13 (Core i5-4260U, HD Graphics 5000) also counts among the Asus computer's rivals, though the Apple product comes without a dedicated GPU. Because the two Zenbooks are structurally identical, we will not cover the connectivity, input devices, display or speakers in detail. Our review of the UX32LN-R4053H provides extensive information on these subjects. 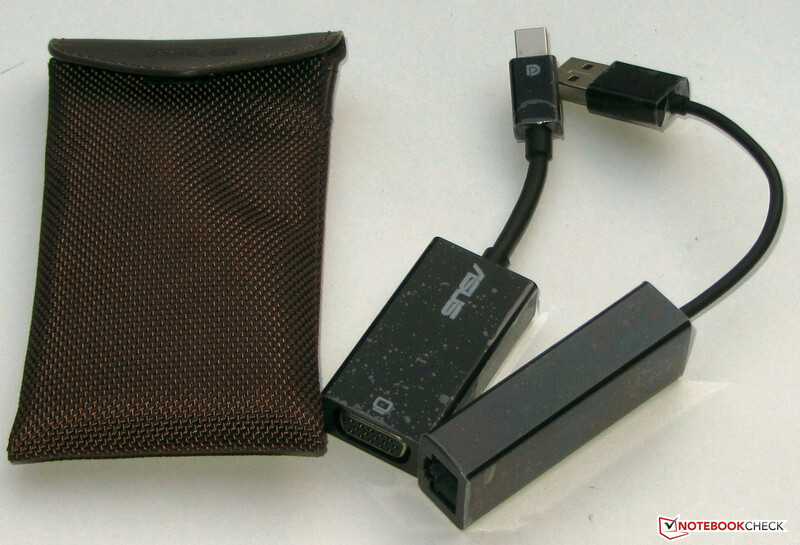 The adapters come with their own bags too. There is one small difference between the two Zenbooks under our scrutiny. The notebook that currently lies before us, the UX32LN-R4029H, comes with a DisplayPort-to-VGA adapter and a USB-to-Fast Ethernet adapter. These items were not included in the UX32LN-R4053H's packaging. See our German forum page for this notebook for information on which models come with adapters (and a notebook bag). 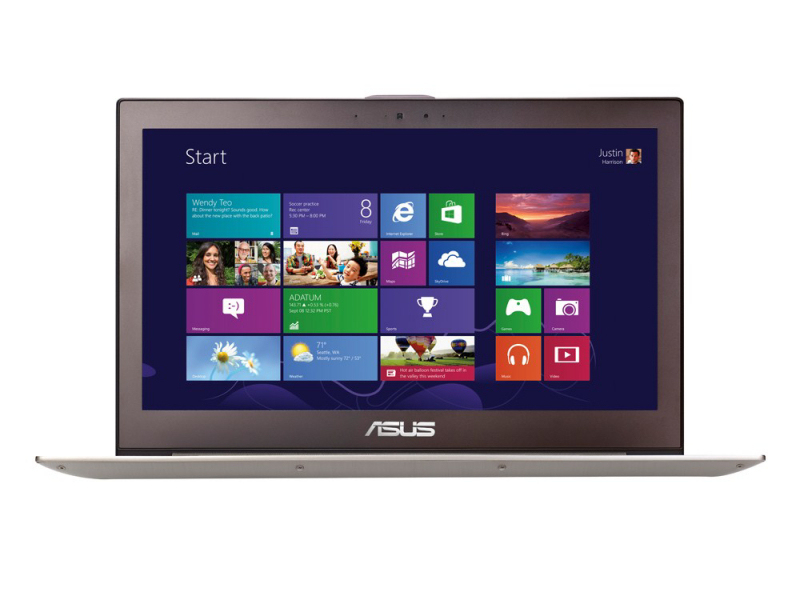 Asus combines mobility, performance, elegance and gaming capabilities in a 13.3-inch notebook. The whole package is currently available for about 1100 Euros (~$1500). There are also versions with different components. The Zenbook UX32LN-R4028H, with its Core i5-4200U processor and 128 GB SSD, can be purchased for about 900 Euros (~$1225). Our Zenbook is equipped with a Core i7-4500U dual-core processor. This Haswell generation chip runs at a base frequency of 1.8 GHz. Using turbo, the speed can be increased to up to 2.7 GHz (both cores) or 3 GHz (only one core). This is a ULV processor with a TDP of 15 Watts. The chip completed the Cinebench benchmark CPU tests at full speed in both AC power and battery mode, demonstrating that the processor's full performance is always available. The system runs swiftly and fluidly. Windows starts quickly -- it would be quite the surprise if it did not, seeing as the device has a strong processor and fast SSD. Our subjective impression is further strengthened by the computer's excellent results in the PCMark benchmarks. It would be easy to switch out the SSD. The Zenbook is outfitted with the same Kingston SSD as its sister model, the UX32LN-R4053H. The SSD has a capacity of 256 GB. 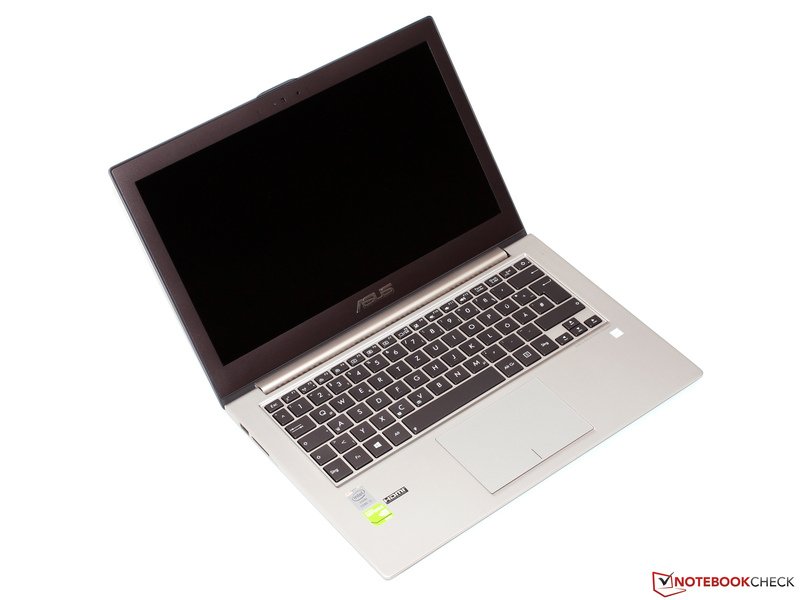 As is common for Asus notebooks, the SSD is split into an operating-system partition (95 GB) and a data partition (121 GB). The SSD's transfer rates are respectable, though they cannot keep up with the current top models. It is possible to switch out the Zenbook's SSD for a quicker model or a model with a greater storage capacity. The SSD installed in our review device is a customary 2.5-inch model. In terms of graphics components, the Zenbook contains an optimal combination formed of Intel's HD Graphics 4400 GPU and Nvidia's GeForce 840M graphics core. The chips have different responsibilities: While the Intel GPU takes care of everyday tasks and graphics rendering in battery mode, the GeForce core is in charge of running high-performance applications like computer games. Both cores support at least DirectX 11. Based on its performance, the GeForce core is a member of the upper-middle class. Its base speed is 1029 MHz. Using turbo, the clock speed can be increased to 1124 MHz. The 3DMark benchmark results look just as we expected. The Zenbook does somewhat better than its sister model, the UX32LN-R4053H. We see two reasons for that: Firstly, our test device has a stronger processor, and secondly, it has a newer graphics driver. Despite its thin build and therefore limited cooling capability, the hardware manages to give all it's got. The Zenbook is able to fluidly run almost every current game in HD resolution at medium to high quality settings. However, the screen's full resolution can only be used for a few games -- FIFA 14, for example. ...the Zenbook does not produce too much noise. In idle mode, the Zenbook does not make a peep. The two fans stand still almost all the time. Of course, as soon as some real power is demanded of the notebook the fans have to start turning. All told, the level of noise generated by the fans is very comfortable -- all that can be heard is a rustling sound. The fans do not produce any high-frequency tones. This picture is mirrored by our Zenbook's sister model, the UX32LN-R4053H. The Zenbook in the stress test. 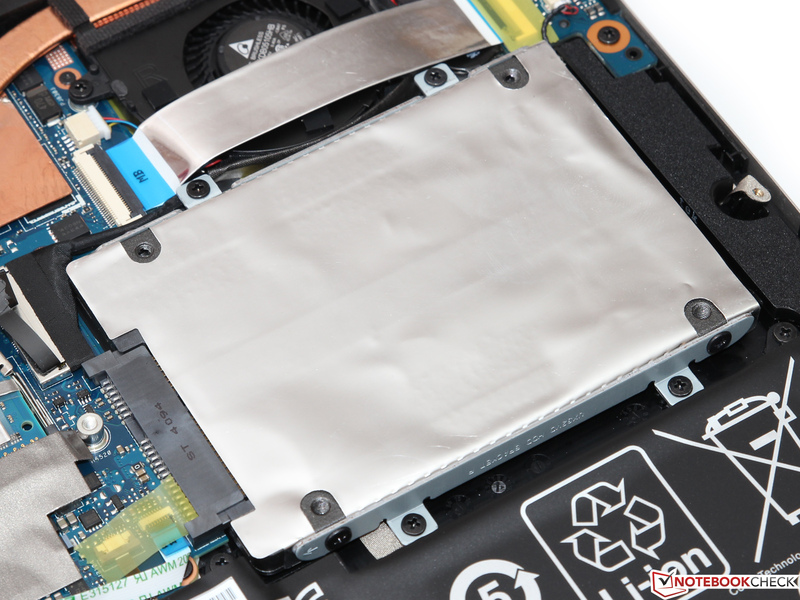 Even with its high-performance hardware, the notebook does not heat up excessively. 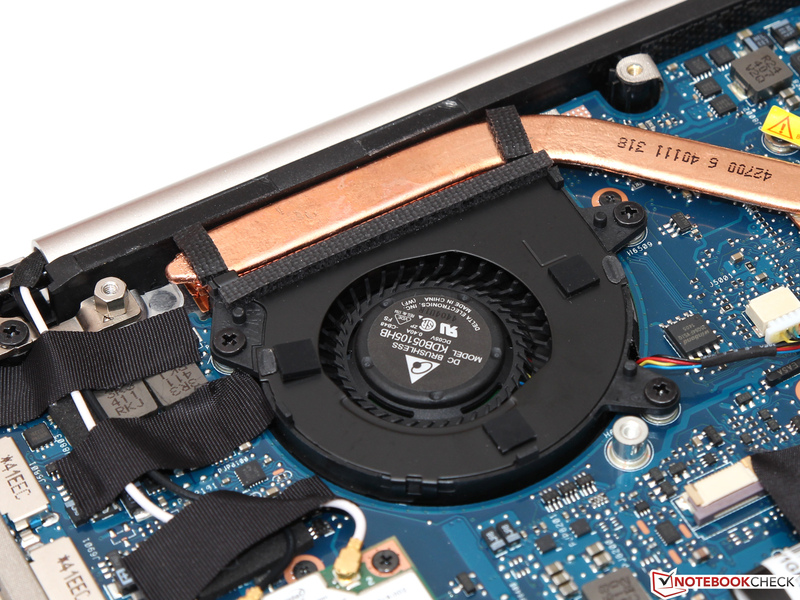 Only during our stress test does the Zenbook's case temperature cross the 40 °C line (104 °F) in three spots. Again, our test device's sister model achieved similar results. 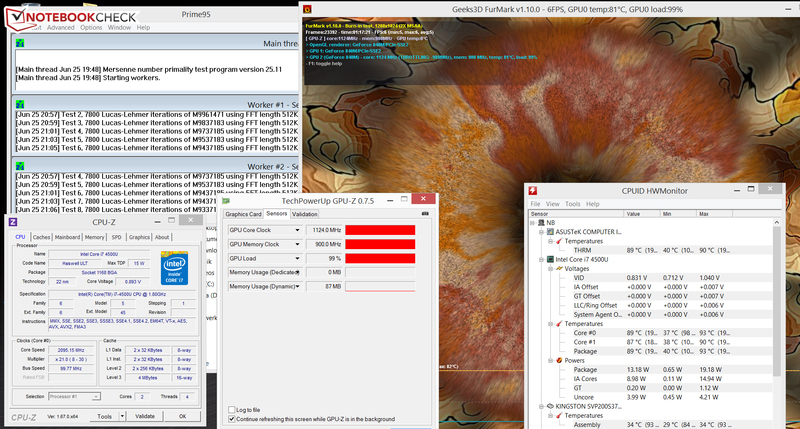 The GPU completed our stress test (Prime95 and Furmark running for at least an hour) in both AC power and battery mode at full speed (1124 MHz). After one hour in the stress test, the processor ran at about 2.1 GHz; its speed fluctuates around this number. At the beginning of the stress test, the processor also reaches higher speeds. In battery mode, the CPU operates at two speeds -- 2.7 GHz and 800 MHz -- and jumps around between these two speeds. The CPU temperature leveled off at about 89 °C (192.2 °F) in our stress test (AC power mode). (-) The maximum temperature on the upper side is 48.2 °C / 119 F, compared to the average of 35.8 °C / 96 F, ranging from 22 to 57 °C for the class Subnotebook. In idle mode, our test device's energy consumption proves to be just as low as its sister model's. Under medium load (3DMark06 running) and full load (stress test: Prime95 and Furmark running), the Zenbook consumes 39.7 and 59.6 Watts more than its sister model, respectively. During the stress test, with time our test device's energy consumption rate sinks to 50.7 Watts. This is the result of the CPU's sinking speed. All in all, the notebook's energy consumption levels are respectable. The battery offers a capacity of 50 Wh. In our WLAN test, which is meant to simulate practical, everyday use, we used a script to automatically load websites at 40-second intervals. The energy-saving profile is active and the display brightness is set to about 150 cd/m². Our Zenbook reached a runtime of 6:11 h, putting it on par with its sister model. We already said everything there is to say about the Zenbook UX32LN-R4029H in its sister model's verdict (the UX32LN-R4053H). Asus created a subnotebook/ultrabook with both gaming capabilities and a good battery life. The components are all packed into a stable and visually appealing aluminum case. The notebook does not warm up excessively, nor does it make too much noise. The device has a great IPS screen to boot. 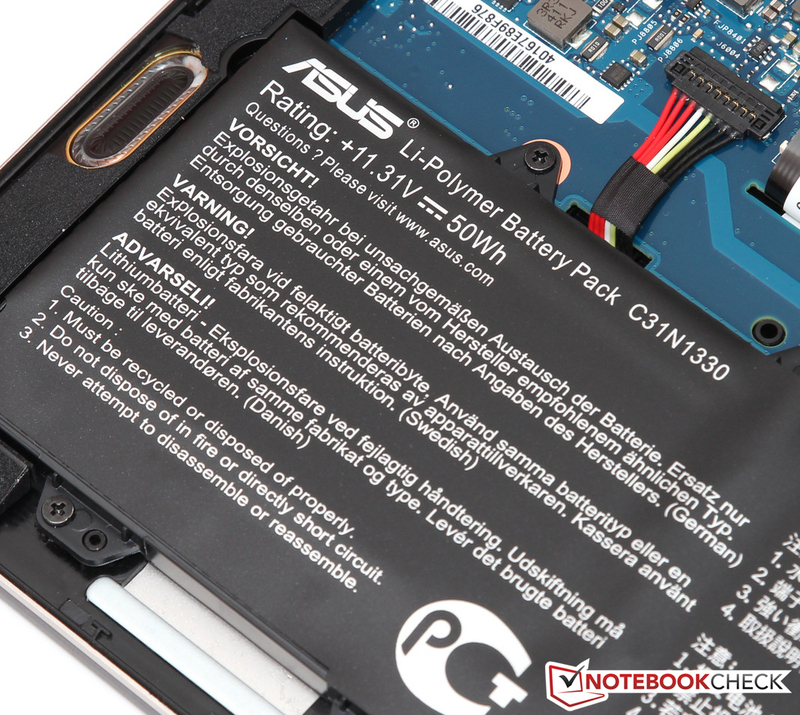 The Zenbook's only minor weakness is its SSD -- here Asus chose a comparatively slow model. However, should the SSD bother a user, it could be easily switched out for a faster model. The Core i7 version of the Zenbook covered in this review does offer somewhat more performance than the Core i5 version and costs about 100 Euros (~$136) more. We only recommend giving out the extra cash for this version if every ounce of performance counts. 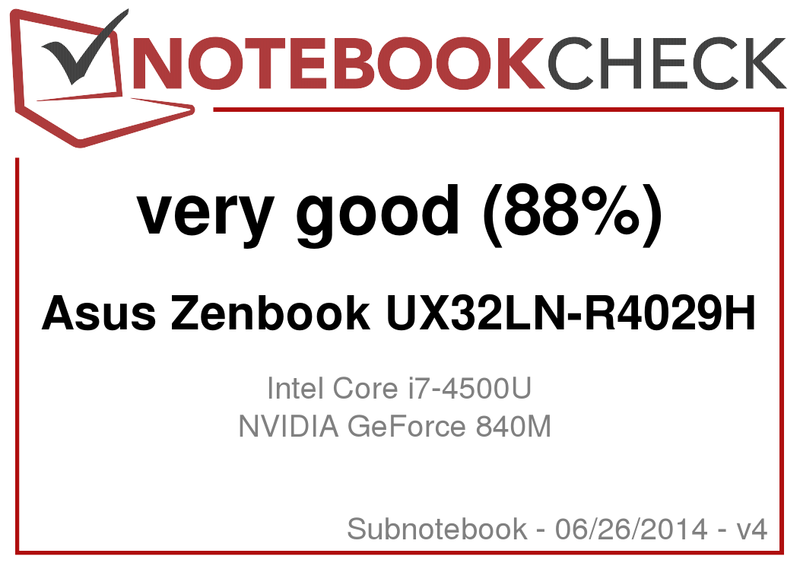 In Review: Asus Zenbook UX32LN-R4029H. Test model courtesy of Cyberport. The device on the whole. The computer does well in almost every area and appears to be well thought-out. Asus' concept works. In truth, we essentially have everything we would like to see. The notebook could have a faster SSD, and the webcam could deliver better results. But these are not serious defects. This Zenbook is a flat, thin notebook that can run almost every game fluidly. Haswell and Maxwell make that possible. Apple MacBook Air 13 MD761D/B 2014-06, Acer Aspire S3-392G, Samsung ATIV Book 9 Lite 905S3G-K01DE, Fujitsu Lifebook E734, Asus Zenbook UX32LN-R4053H, Samsung ATIV Book 9 900X3G-K01DE, HP Spectre 13-3010eg.